No reader of Darwin’s masterworks The Origin of Species and The Voyage of the Beagle can fail to notice the poetic quality of his observant pen. During his travels from South America to Australia, Tahiti, New Zealand, and, of course, the Galapagos Islands, he meticulously recorded in his journal microscopic shifts in species, his eye looking beneath the surface for clues to the intricate connections between species and their habitat. 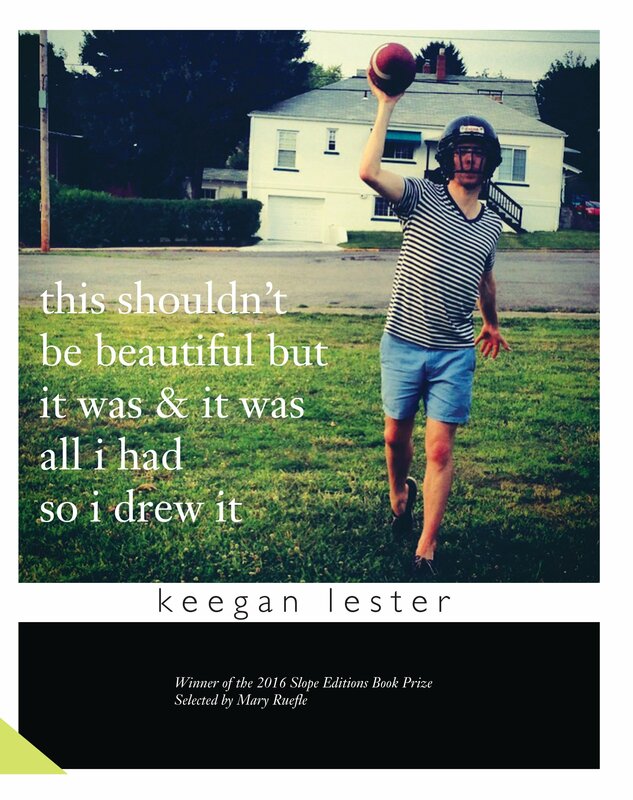 In his this shouldn’t be beautiful but it was & it was all i had so i drew it, Keegan Lester, like Darwin, records the beauty of change and adaptation, poetically challenging readers to examine the exotic while focusing on the everyday tragic moments of human existence. The book is the poet’s first full-length collection, winner of Slope Editions’ 15th Annual Book prize, and has been described by Timothy Donnelly as “unapologetically cosmic in its scope.” Reading through Lester’s work directs the reader through untrodden dimensions of the word “cosmic” as his language and imagery release bold, paradoxical, even evolutionary themes. Lester explores the strengths and frailties of human connection always working in tandem and against each other at any given moment. Save on the “Contents” page, Lester does not title individual poems in “ghost note.” He distinguishes the parameters of this collection with a conditional curiosity: if comets raining overhead. But that conditional “if” is not qualified later. Lester’s opening “if” hangs there, plucking the reader out of her personal space and into the space inhabited by comets, gravity, stars, roman candles, piles of stones, and bedtime stories. Throughout the work, Lester masterfully utilizes the empty white space of the page, employing simple block format for his opening as a space to play in cosmic terms. The space around the poems is empty, but full of the heft of the cosmos. Lester contrasts short, block poems with more traditionally lineated pieces, a juxtaposition that moves the reader from space to space without the barrier of official titles to set off one poem from the next. This fluid movement from block poems to creatively lineated pieces transports the reader from the limitless scope of the stars to the finite confines of the football field. neither of us can be who we are without football. it’s true the way a cardinal can’t be a cardinal without both wind beneath it & red about it & some nights when i look out into it, into the night & the blacks so close to blue, i can pretend that there’s something that tastes better than the pharmaceutical dust i fell for at fifteen, . . . The reader is plunged into the personal space of the speaker and the Friday night “stadium light” which hovers like an aura around the poem’s subjects. The block format enhances the metaphorical space between pieces. One of the work’s central themes, that of bodies filling time and space, is emphasized in the final line and a half of this single block of text:”i was like you, down there, beautiful & fatalistic, a body filling time & space. I was once nothing too, nothing chained that couldn’t be unchained by stadium light.” The reader is provoked by these bodies “filling time and space,” both the bodies of the poetic subjects and the bodies of text which shift and evolve on the page throughout the work. Drifting from the football field back out to wide-open space, Lester invites the reader into a scriptural reverence of our participation in evolutionary development. there was once the heavens & the oceans. there was once the chicken & the egg, there was once the atom & the eve & then gunfire. . . . our hearts & hands & eyes, all small star critters etched into some rock. the rocks will outlast us & anything we had to say about us. & we the mason jars of lightning bugs in the dark. The poet’s deft move from oceans, atoms, Eve, the chicken and the egg to the simple bittersweet act of capturing lightning bugs in Mason jars, evokes childlike awe through the lens of natural selection, a Darwinian concept evoked by Lester’s poetic acumen. a piece of them dies. she says, with her eyes closed. Beginning lines with ampersands, deconstructing period placement and pauses produced by commas and white space, the writer subtly disrupts the rhythm of the couplet. my mother is sick & cannot leave her bed most days. i am of my mother & therefore i am sick too. This piercing couplet is repeated in different forms and contexts throughout the piece. thinking oil, –& other miracles in the wrong language. but one another. . . .
Lester concludes the collection with a Coda, the last poem of which is entitled “Ars Poetica,” a poem that opens with the line “still under construction.” The entire collection begs to be co-constructed with the reader in a variety of times and landscapes, examining the poetic subjects that evolve and dance at considerable depths beneath the surface. Lester brings the work to a close with the evocation of Horace’s (or Archibald MacLeaish’s) instructions on the nature of poetry. Horace writes, “the aim of the poet is to inform or delight, or to combine together, in what he says, both pleasure and applicability to life.” Lester’s poems dance in the space between Horace’s pleasure and applicability. this shouldn’t be beautiful but it was & it was all i had so i drew it marks a distinctive moment in the evolution of contemporary poetic memory. It’s a work which, while perpetually “still under construction,” delights the reader by leaving her feeling remarkably whole. Amy Penne, PhD, is a writer and Professor of English at Parkland College in Champaign, Illinois. Her publications include poetry and essays published in Creative Nonfiction’s InFact books’ collection Oh Baby! True Stories About: Conception, Adoption, Surrogacy, Pregnancy, Labor, and Love; Minerva Rising, Embodied Effigies, Mouth, the I-70 Review, Change Seven, The Drunken Odyssey podcast, and others. Amy will be a featured reader at Pygmalion Lit Fest in Champaign, Illinois in late September.